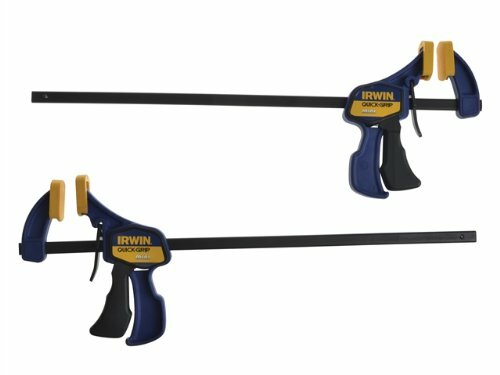 How To Use Work Piece Clamps? If you are going to be using a mitre saw for cutting, then you would be well advised to clamp the wood down. 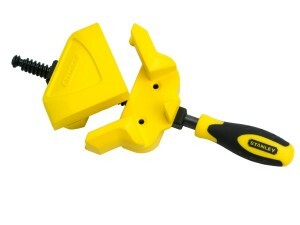 Many mitre saws come with a clamp built right into them, and if it does, then please make sure that you make use of it. This stops any wood from flying around and also helps to prevent the blade on your saw from sticking or jarring. Using a clamp on longer pieces of timber is like having an extra pair of hands. It makes a real difference by supporting the weight and length of the wood you are cutting. My one piece of advice that I would offer here that is if your are going to buy these, just make sure that they have non-marking clamps as you do not want them digging into the wood. You will see from the picture above, that these are shown in yellow, and they really do help protect the work surface. If the wood can not move, then your cut will be a lot more accurate and that is important, especially when you are cutting mitre or compound mitre joints. Many of the manufacturers refer to the safety element as being the main advantage, but to be honest, for me that is just plain old common sense. Clamps are also really useful if you want to hold a number of pieces of wood or timber together so as you can cut them all at once. I have done that many times as it makes sure they are all exactly the same length. It also saves you a great deal of time. I would use this when cutting wood for fences and even for floors. This would be one of the main uses for woodworking. Often when joints are made, the glue needs time to dry. Clamping the pieces together leave you free to get on with other work. It also makes sure that the wood is held very firmly together and this just makes a much tighter and better joint. Something like the Stanley corner clamp is a really useful one to have. This type of clamp is really useful if you are making shelves or any type of cabinets. Anything that needs to be joined at right angles will probably need to be held in place until the glue sets. This one in particular is really useful for doing that type of work. This one really is like having an extra pair of hands. I have a few of these in my own workshop and they have been well used. It isn’t great at holding longer pieces of timber, but works well with 90 degree joints. Some people are quite clever when it comes to making their own clamps. I found this interesting video on YouTube which is worth a watch if you have enough time. A neat little trick if you don’t have any clamps for sure. The important thing though is that if you are going to be using a mitre saw, then make sure that the wood is clamped down as that will just make your life a great deal easier. In the ideal world, buy a good quality mitre saw as that will have one included and in the right place. All you have to do then is place it on the wood, and simply tighten it up. Even when you have that, it is always a good idea to have some wood clamps in your tool kit. They do not cost a fortune and they really do free up your hands to concentrate on what you are doing.